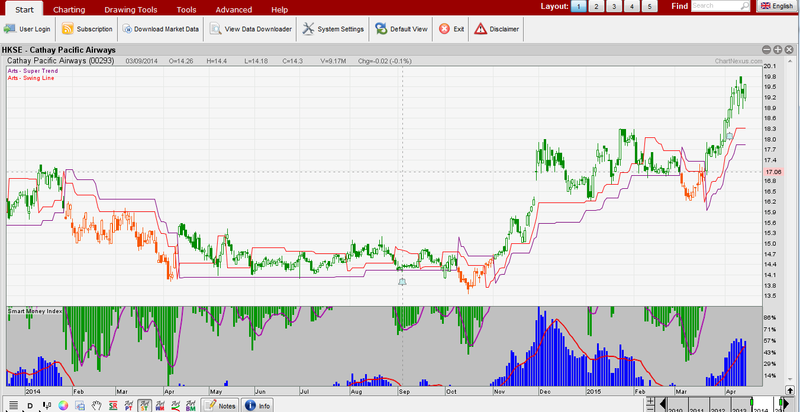 Now we see CATHAY PAC AIR has changed from orange to green, it indicates the trend is changed from bearish to bullish. Below is a finance news of CATHAY PAC AIR from AAStocks Financial News for your reference. Credit Suisse stated that the statistics of CATHAY PAC AIR (00293.HK) in March reflects a strong performance in its first quarter. Its operating situation exceeded the broker's estimate. Due to the fuel price and the possibly-better-than-expected performance in its associates, the broker lifted the earnings forecast in 2015, 2016 and 2017 by 9%, 7% and 6% respectively. The rating was maintained at Outperform while the target price was lifted from $19.5 to $23. Do Join our stock discussion session every Thursday and Friday !